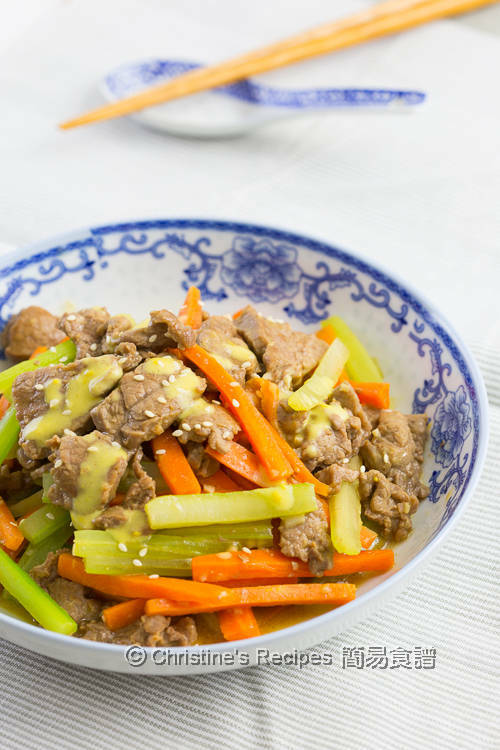 This beef stir fry with mustard sauce is quick and nourishing. 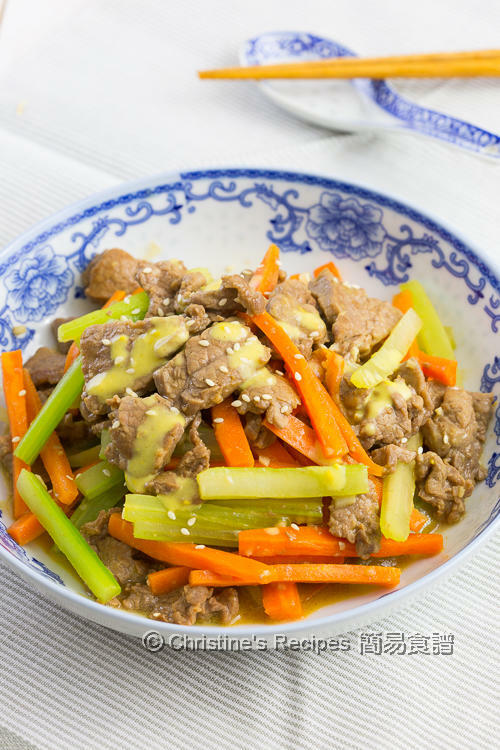 The mustard sauce is so appetizing and makes the stir-fried tender beef much more delicious. To make this dish, nothing is too complicated once you choose the right cut. Whenever I make stir fry dishes, I always like to use skirt steak beef. The grain of the meat is clearly seen running from one end to the other. 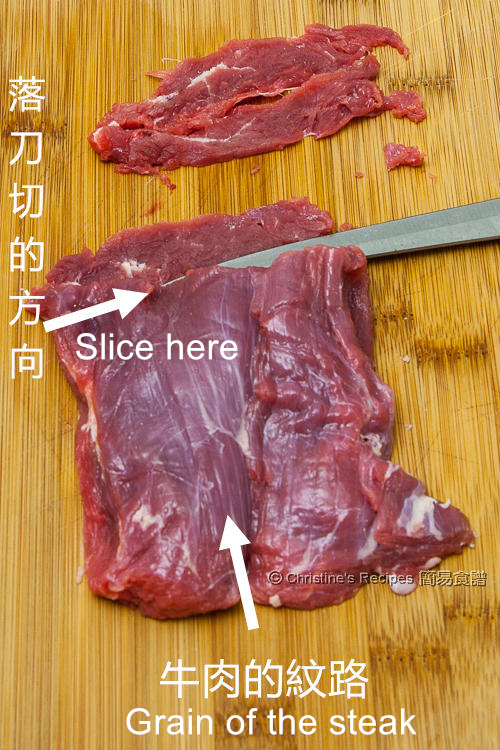 If you slice across the grain of the beef, that means cutting off the tissue, your beef will be tender after briefly stir-frying over high heat. Make sure not to over-cook the beef though. Some of you might live in the other side of the world, like US, you can use flank beef steak. The highlight of this dish is the mustard sauce, taking the beef up a level. The taste of the sauce is not too spicy, but a bit sweet mingled with sour. So this dish is also very appetizing. If you’re into spicy food, you might like to increase the amount of hot mustard sauce. To get the best results, stir fry vegetables and meat separately due to their different cooking time required. By doing so, it’s much easier to control the outcome. 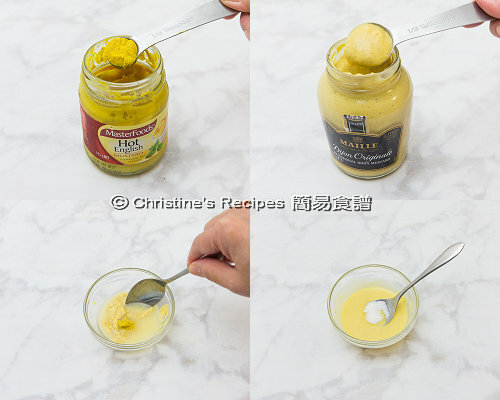 Mix all the ingredients of mustard sauce. Set aside. Slice beef across the grain. Mix with marinade well. Set aside for 20 minutes. Heat oil in a frypan over medium-high heat. Saute garlic. Add celery and carrot. Stir to combine. Pour in chicken stock. Cook and reduce the stock by half. Season with salt. Set aside. Add more oil in the frypan. Place beef in one layer without overlapping. Cook until colour changes. Flip to another side. Cook until colour starts to change. Toss back celery and carrot. Quickly combine. Stir in the mustard sauce. Garnish with sesame seeds. Serve immediately. If you’re into spicy food, increase the amount of it according to personal preference. 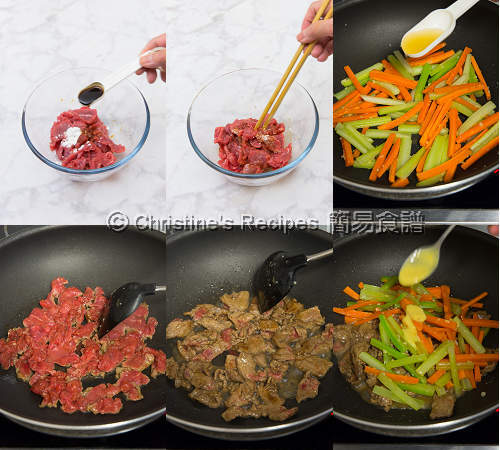 When it comes to stir-frying beef, I find it’s best to place beef in one single layer in a hot pan, like cooking a piece of beef steak, without flipping it restlessly. To get the best results, finish cooking one side, then the other side, until it’s cooked until 80% doneness. Immediately stir in other vegetables. The beef won’t be overcooked then. The beef slices look really tender! Stir fry is always one of my go-tos, but love the spin you've put on this sauce! Sounds delish!